How do I grow strawberries in Iowa? How do I care for my Easter lily? How do I grow beets in my garden? What are some spring-blooming trees for Iowa landscapes? Which Iowa native woodland wildflowers can I grow in my shade garden? Floods and morel hunting, oh my! More Horticulture and Home Pest News articles. 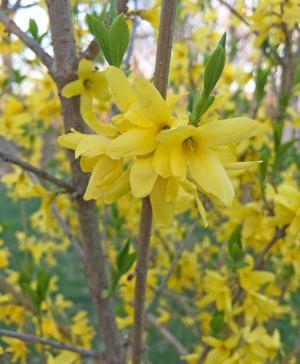 Bloom of the Week: As the flowers fade on forsythia, it is time to apply pre-emergent herbicide to your lawn to control crabgrass. FAQ of the Week: When can I plant potatoes? Pest of the Week: How do I control violets in my lawn?